Our first fall in Nashville has been really great. I’m enjoying our new house and all of the fall related decorating, which you can read about here and here. 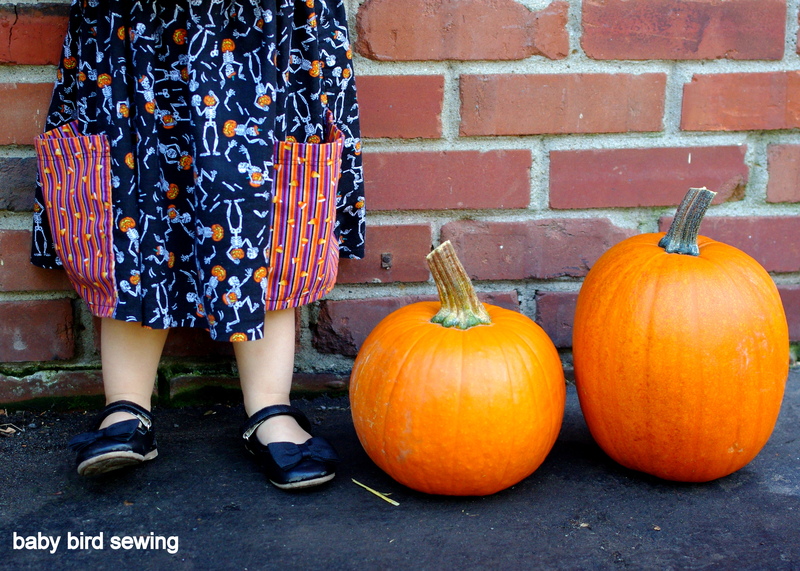 I’m super excited about my Halloween sewing projects too. These dresses are the first on my to-do list with costumes to come very soon. 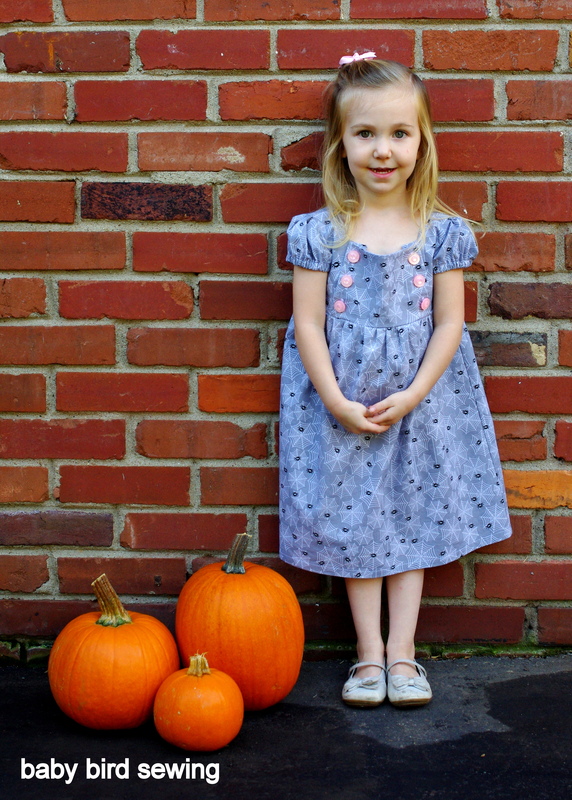 While I’d love for you to be amazed at how productive I am in pumping out dresses, in all honesty, I sewed this Sally dress for Hannah last year. My mom sent me the fabric (I think it was from Joann’s?) but I didn’t know what to do with it. I wasn’t sure that it would work for a girl’s dress but I had just bought the Sally dress pattern and was itching to make one. I figured if it didn’t turn out, I just wouldn’t have Hannah wear it. But I LOVED it! Again, one of the very best parts of the Sally dress is the pockets. Nothing better than big pockets, except maybe big pockets with a contrasting/coordinating fabric. So much fun! 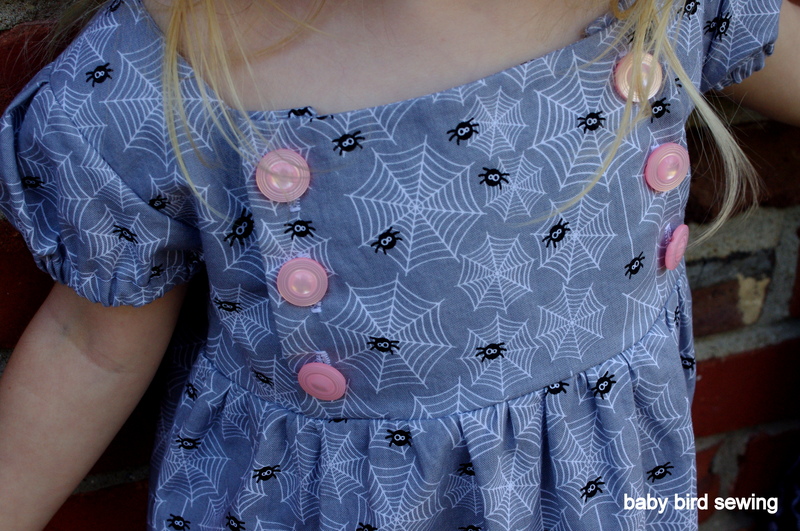 For Hannah’s Junebug dress, I used Riley Blake’s Halloween Parade Spider Webs. I really wanted the purple but it was on backorder at fabric.com until November, and I obviously would have no use for it then, so I went with the gray. Thankfully I had some pink buttons on hand because pink is pretty much all Hannah wants to wear these days. The black, white, and gray wasn’t going over too well at first…I think she’s getting over it now… The other day she insisted on wearing neon pink head to toe and could not be persuaded otherwise. Sheesh! The Junebug dress holds a special place in my heart. This pattern is by Jess from Craftiness is not Optional, my favorite blog of all time! 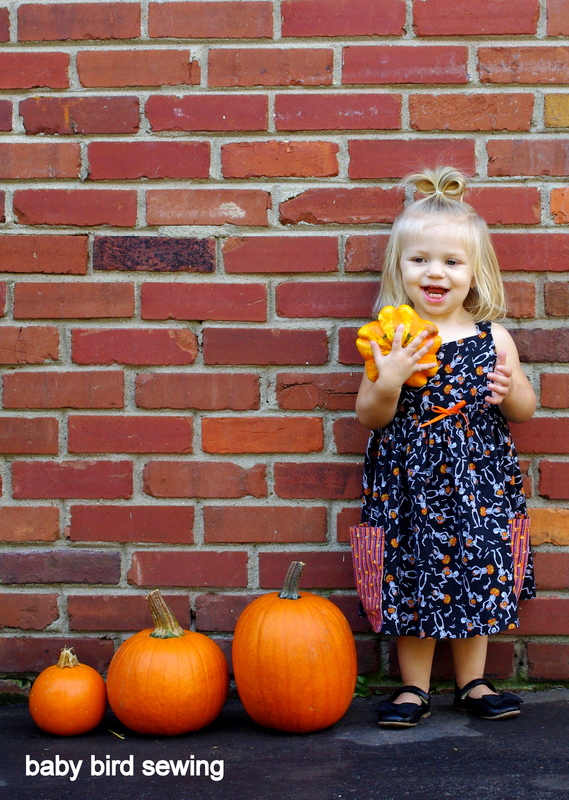 When I was first thinking of learning to sew baby clothes, I found her site and instantly fell in love with the Junebug dress tutorial. I made one using a self drafted pattern, which looked cute but was horribly proportioned and unwearable. I had always wanted to revisit this dress but just haven’t until now. And now there is a pattern, so no more self-drafted patterns this time around! I love the classic look with the buttons on either side of the front placket and the adorable puff sleeves. It doesn’t get much better than this in my book. There are only two minor downsides to this dress. The first, that I sewed a size 3 instead of a size 2. Hannah is pretty petite for her age and in between the sizes, so it’s a little roomy. Since it’s a Halloween dress, I could have made it a size smaller for a closer fit without worrying about her outgrowing it quickly. Afterall, it will get put away for Katie for next year in a matter of weeks. The second downside was that it wasn’t as full of a skirt as I typically prefer, which is partially my own fault. I eeked this dress out of only one yard of fabric! Awesome way to maximize yardage and minimize expense, but the result is a slightly slimmer skirt than the pattern calls for. The next time I sew this dress, I’ll likely make it fuller than even the pattern calls for. 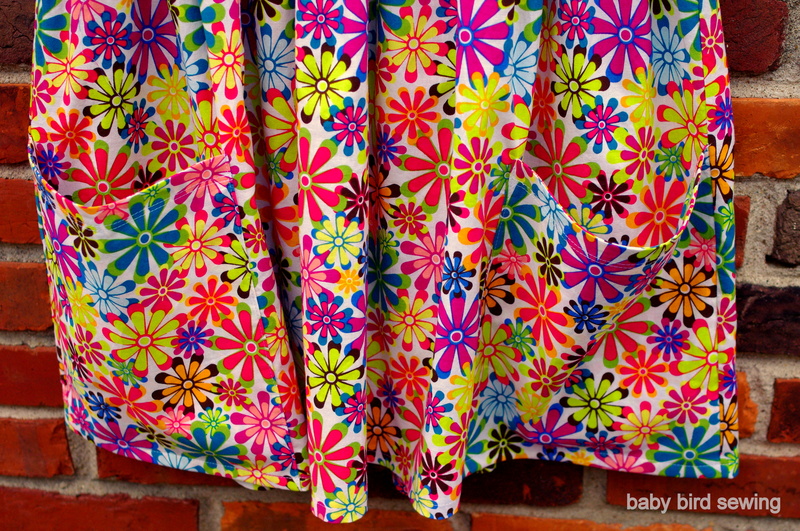 I prefer a twirlier skirt and I have found that gathers look nicer and more even with more fabric. But it’s a super cute dress and I love it in spite of these two itty bitty regrets! 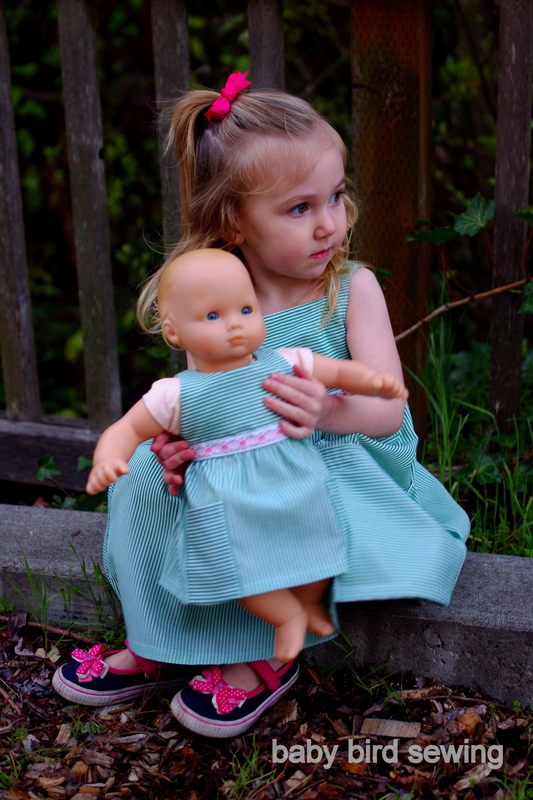 This is a Sally dress I made for someone very special. J is a friend from our church in California, who from our first meeting when she was in first grade, has always been extremely friendly, helpful, caring, trustworthy, responsible….and the list goes on and on. This past summer, she was diagnosed with Ulcerative Colitis and has had quite a journey, which has included hospitalization and ultimately surgery. Thankfully she has adjusted well and has overcome many challenges in this process and seems as upbeat as ever. This fabric was a gift from my dad, one of a few different prints he sent me awhile back. 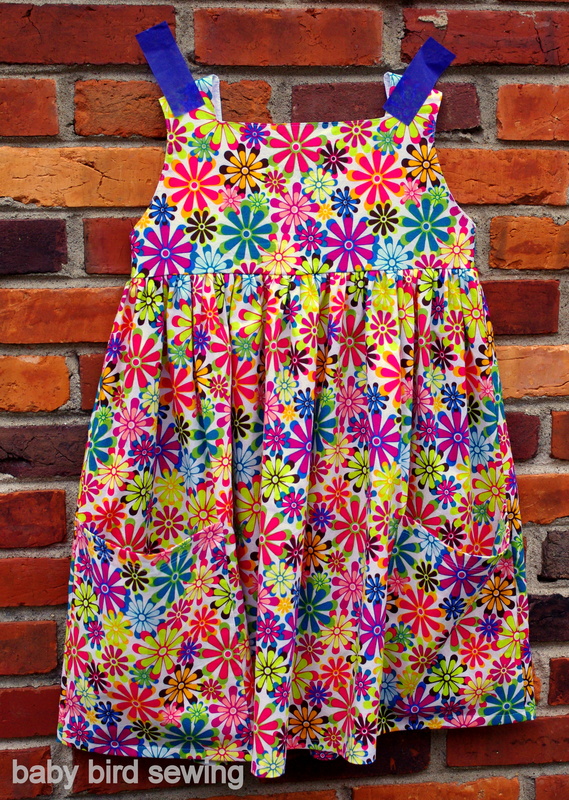 The first time I saw it, I immediately thought of J and of her love for vibrant colors and groovy prints. It had her name written all over it. 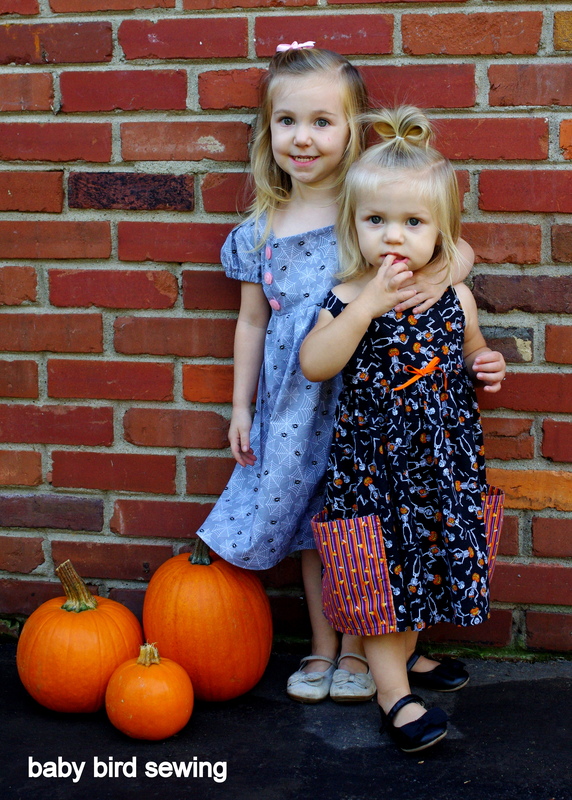 I never knew what to make with it until I fell in love with the Sally dress pattern. Who doesn’t love big pockets?! 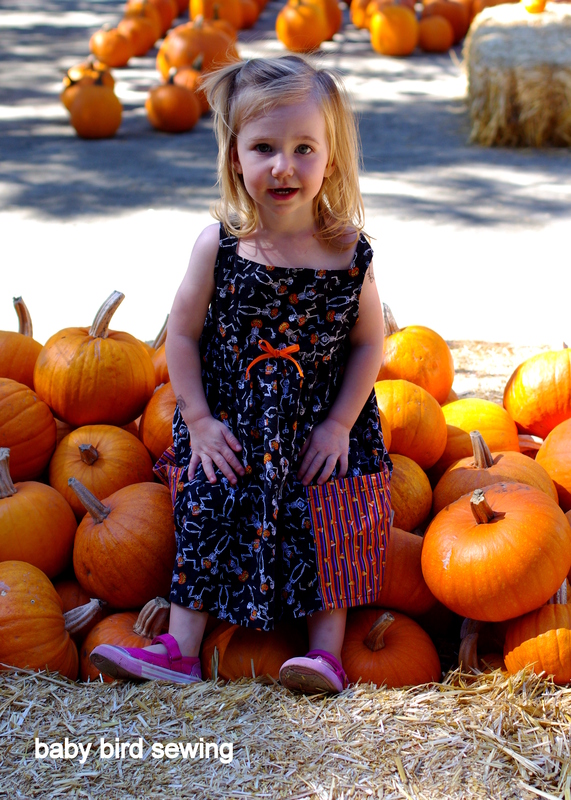 I started making this Sally Dress as a destashing project right before we moved to Nashville (and before any of her symptoms had manifested). Obviously I never finished it before moving and have had it sitting around now for a few months. The other day, while thinking of J, I realized that I really needed to finish it up and get it sent off to her. Lately I’ve been thinking a lot about this special girl as she gears up for another surgery (the second of three). I’ve been thinking about how much I love her and miss her and how I am deeply proud of her courage as well as her generosity during this new challenge she faces. Rather than just going through this process, trying to make it day by day, wondering why it happened to her and the normal things we all might wonder, she instead decided to start making bracelets (while in the hospital!) and selling them to benefit the Chrohn’s and Colitis Foundation. She sold them to family and friends and ended up raising $500! Truly a remarkable young woman. I love her and miss her. And I hope that when she receives this dress in the mail next week sometime, that she knows how truly special she is and how much we all love her. If you would like to learn more about Chrohn’s Disease and Ulcerative Colitis, please visit the website www.ccfa.org. And even better, you can donate to support new research that will help people like J! 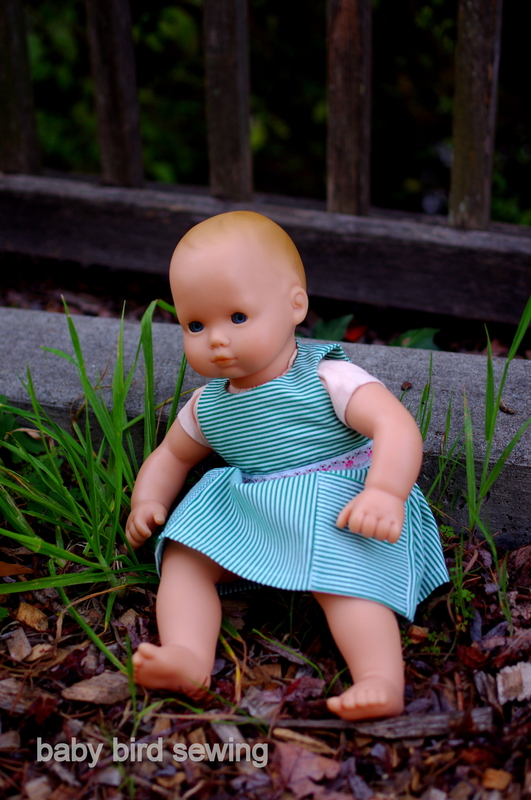 I sewed this up and photographed it awhile ago, but here it is finally on the blog after many months…This is the Sally Dress by Very Shannon. I LOVE this pattern! Over the past year or so that I’ve had it, I think I’ve sewn up three. I love that there are no closures and the huge, adorable, kid-friendly pockets are the best. I added the ribbon around the base of the bodice on this Sally dress to break up the stripes and to give it a more girly detail. This one I sewed up for Hannah for St. Patrick’s Day with some fabric sent by my husband’s Aunt Pam, who so kindly sends me large packages filled with fabric that she no longer has use for. Makes my day, or really more like my week or even month, when I get one of those surprises in the mail! 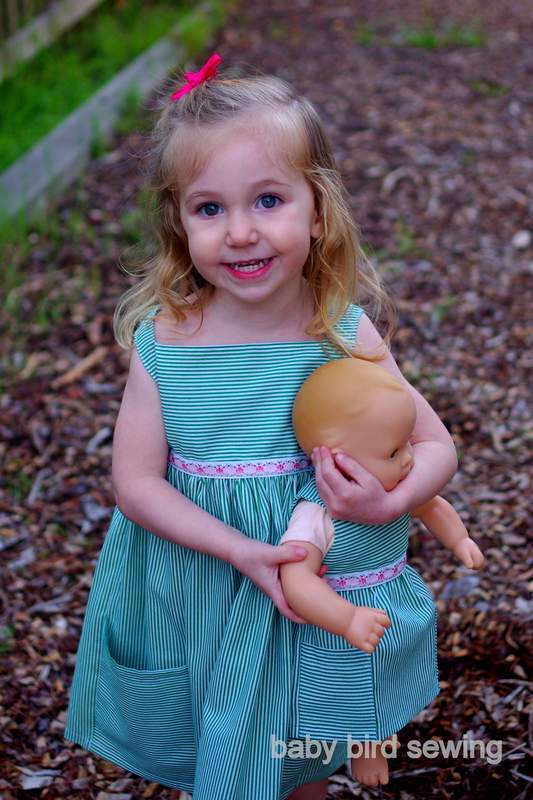 Hannah is not much of a doll girl, but she was really excited when I surprised her with a matching doll dress. I always loved it when my mom made matching sets of pajamas for my cabbage patch doll and me when I was little. Nothing better than matching your favorite doll!